What the hell is the Obama administration thinking? Last Monday it was announced a long planned intercontinental ballistic missile test has been delayed until next week at Vandenberg Air Force Base in California. The official spokesman for the Pentagon gave the reason as mounting tensions with North Korea. Newly confirmed Secretary of Defense Chuck Hagel personally delayed the long-planned Minuteman 3 test. Whether or not it was Hagel or the White House, the reasoning behind this move was to avoid the North Koreans from misinterpreting the launch and exacerbating the current Korean crisis. 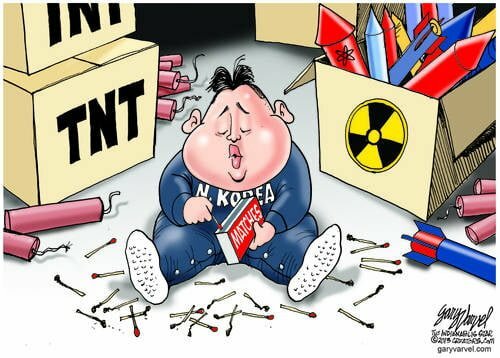 The most powerful nation is the world delays a long planned missile test because it might upset a tin horn dictatorship in North Korea? Just exactly how does that come across to bigger nuclear threats to the world – specifically Iran? Naturally the “official” spokesman gave the briefing with the assurance of anonymity to the press. This comes in the wake of the North Korean military warning the U.S. government they are “authorized” to use “smaller, lighter and diversified” nuclear weapons. Who could that be “authorizing” such an ominous threat? It must be the newly installed 28-year-old punk, Kim Jung Un, replacing his daddy. The pentagon’s statement is provocative to say the least. A third rate power living in the middle ages has the power to delay a long planned military exercise by the United States of America? The “official” spokesman said in anonymity that U.S. and South Korean military exercises are ongoing, with warships and bombers in the region. It makes you wonder if the late Margaret Thatcher or Ronald Reagan would have made such a stunning concession to these pip squeaks. Is it any wonder the U.S. is losing respect all over the world?